when my friend Rowena submitted it to our first church cookbook. Since then I've come across many versions of this recipe. Some use chocolate pudding mix, others a combination of chocolate and vanilla instant pudding. lemon instant pudding Rowena's recipe called for. We enjoyed the more intense lemon flavour the pie filling added. It was delicious. For crust, cut butter into hazelnuts, flour and salt to form crumbs. Press crumbs into the bottom of a 9" x 13" pan. Bake at 350º for about 15 minutes. Remove from oven and cool on a rack. For the lemon pie filling, mix sugar, cornstarch and flour in a medium saucepan or the top of a double boiler. In a large measuring cup, combine egg yolks with lemon juice and zest and beat well. Add water and whisk to combine. Whisk liquid into dry ingredients and heat over medium heat stirring constantly. Cook until it begins to bubble and thicken. Stir in butter and extract. Whip 2 cups whipping cream until soft peaks form. Do not over whip. Set aside. Add icing sugar to the cream cheese a little at a time until it is well blended. Measure 1 cup of the whipped cream into cream cheese mixture and fold gently until it is incorporated. Spread cooled lemon pie filling over cream cheese layer. Add 2 tablespoons icing sugar to the remaining whipped cream and beat just until it is mixed in. Spread whipped cream over lemon filling. Sprinkle with more ground hazelnuts or chopped hazelnuts and refrigerate until serving time. Note: be sure the crust and lemon filling have cooled to room temperature before topping with the cream cheese and whipped cream. This sounds amazing, especially with the lemon pie filling. Thanks. I'll try this one soon. Are the hazelnuts toasted or untoasted in the crust? could they be toasted for the sprinkle on top? We have hazelnut trees on our property and so after they are cracked, I dry them very slowly in the oven which gives them that toasted flavour. But yet, toast them if you like. Anything that adds another layer of flavour is always good. For those who don't have hazelnuts, pecans or almonds would work just as well. Love reading your blog! Do you have a recipe for Cranberry Relish using oranges and nuts? I haven't tried this recipe myself but it sure looks good. I have been making the chocolate/vanilla pudding version of this delicious dessert. 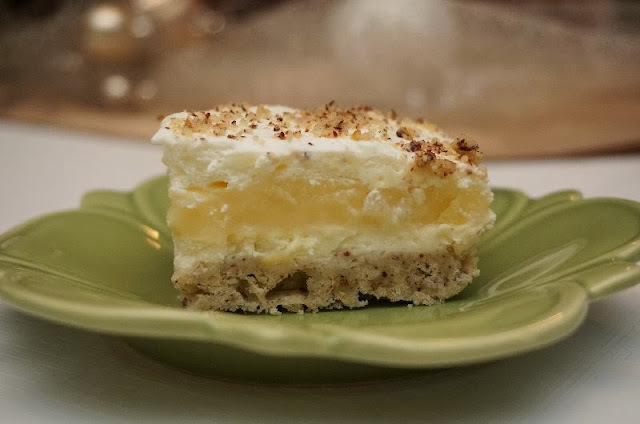 I never thought of making it with the lemon pie filling. I started making this about 30 years ago when it was in one of the first cookbooks I purchased while living in a college apartment. I think it was called "Better than Robert Redford Cake". The name might need a little updating, but I have never served this dessert where the plates did not come back completely empty. I think I will be making this for New years dinner and try making it in a a spring-form pan to give it a more elegant presentation. Thank you for inspiring me to try your lemon version. Have made this one before and it is delicious!!!! I made this for our Lady's Lunch Bunch yesterday and it was a real hit! Everyone loved it and I was asked for the recipe. I also posted the link on facebook and had some shares and more requests for the recipe. Unlike some recipes, this looked just as good as the picture showed it. A keeper!